Solar Flares are pretty common events whereby the sun emits a coronal mass ejection of magnetic energy from our Solar System's main energy source. 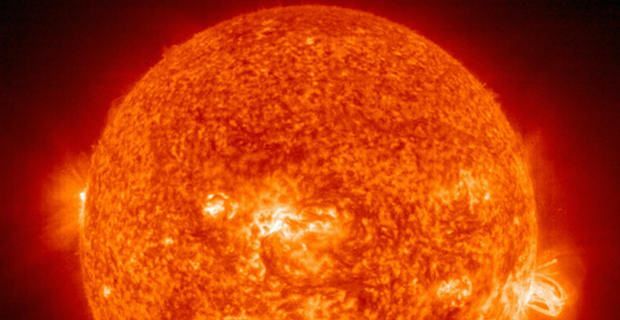 However, scientists have warned that after the solar flares of 2014 we ain't seen nothing yet and we are overdue for a Solar Superstorm that could have catastrophic consequences for our planet and humanity. Scientists predict that huge Solar Flares, known as Solar Superstorms, occur approximately once every 150 years. The last major one occurred back in 1859 and became known as the Carrington event. This event sent a mass of magnetic energy crashing towards Earth but back then there was not a whole lot of impact on daily lives as communication systems were minuscule compared to today's world. The projection of every 150 years means that we are about 5 years overdue to experience another huge event. Solar Superstorms have the ability to cripple the Earth's communication systems as well as medicine production lines and sanitation systems. Researchers are of the belief that since these Superstorms are such a regular occurrence then it would be wise to set up a worldwide satellite detection system to warn of impending disruption. Ashley Dale of Bristol University outlined the implications of a Superstorm hitting Earth in this day and age saying "Without power, people would struggle to fuel their cars at petrol stations, get money from cash dispensers or pay online. Water and sewage systems would be affected too, meaning that health epidemics in urbanised areas would quickly take a grip, with diseases we thought we had left behind centuries ago soon returning." The Earth had a narrow escape from a Solar Superstorm in July of 2012 which would have dwarfed the Carrington Event for energy output. There have already been a couple of large solar flares this year with one of them managing to disrupt communication systems on Earth for a number of minutes. What will become of UK Flag should Scotland become independent?